MERLIN BLACK GOLD DRAGON 9"
Nancy’s Plush Toys & Gifts is where fantasy meets reality with our mythical creature toys. 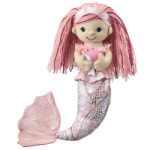 Our specialty mythical creature toys feature gifts for both boys and girls. These plush toys are perfect especially for room décor or theme birthday parties. Whatever the occasion, we have the hard to find mythical toys every kid loves. Every item is carefully handpicked from one of our trusted toy partners ensuring every toy last for years to come. Brighten your loved ones day with one of our featured products. Discover the right mythical toy for your little one such as the Venus Unicorn Flopsie, Hansa Pegasus, Pink Mermaid with Dolphin or Hansa Red Dragon Baby. If you are looking for a particular mythical creature please send us an email with the type of product. We are actively looking to expand our inventory and may have what you are looking for. Be sure to visit this page frequently as we update it often.